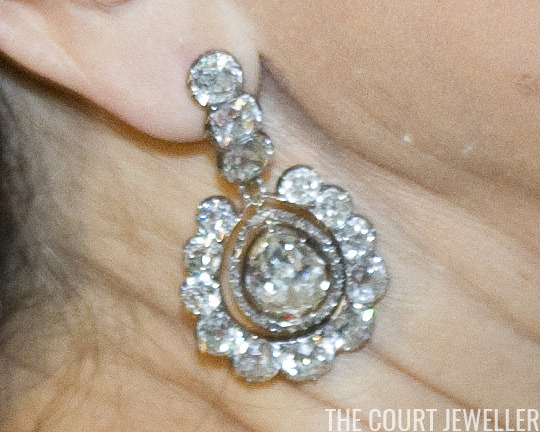 We recently talked about one of the oldest pairs of diamond earrings in the Swedish royal collection, the Vasa Earrings. Today, we're looking at their little sisters: the Karl Johan Earrings. While the Vasa earrings date back to a seventeenth-century Swedish dynasty, the Karl Johan Earrings belonged to the first member of the current reigning family, the Bernadottes. Jean Baptiste Bernadotte was one of Napoleon's trusted military leaders before he was elected King of Sweden. He took a new name -- Carl (or Karl) XIV Johan -- upon his accession in 1818. These diamond earrings date from the time of King Carl XVI Johan's reign. They feature three stacked brilliants, from which a large, pear-shaped pendant is suspended. Eleven brilliants form a frame around the central part of the pendant, which consists of a large pear-shaped diamond surrounded by a thin border of additional diamonds. The earrings' construction is very similar to that of the Vasa Earrings, but this pair is rounder, while the Vasas have a more elongated pear shape. 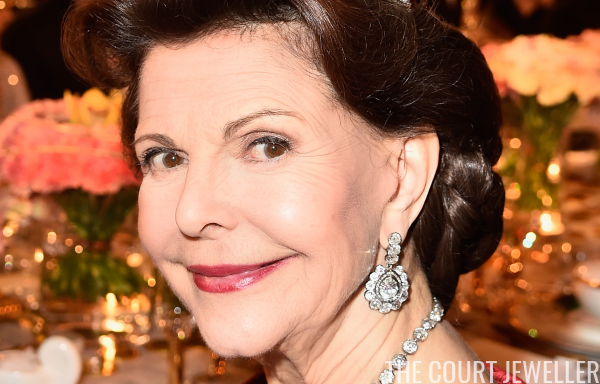 The earrings are a part of the Bernadotte family's jewel foundation. Today, they are worn primarily by Queen Silvia. She often pairs them with other diamond jewels, but their all-diamond composition makes them easy to coordinate with other jewels, including the King Edward VII Ruby Tiara. 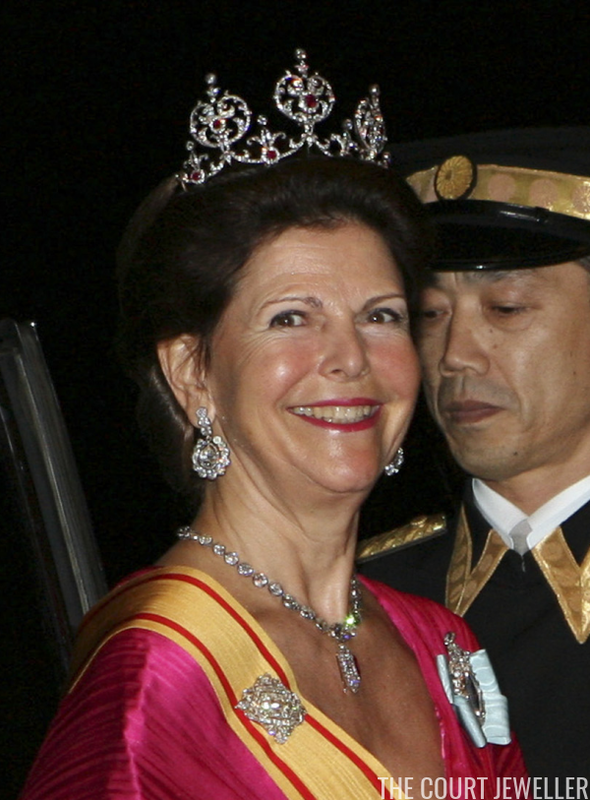 Above, she wears the earrings with the ruby tiara in Japan in 2007. 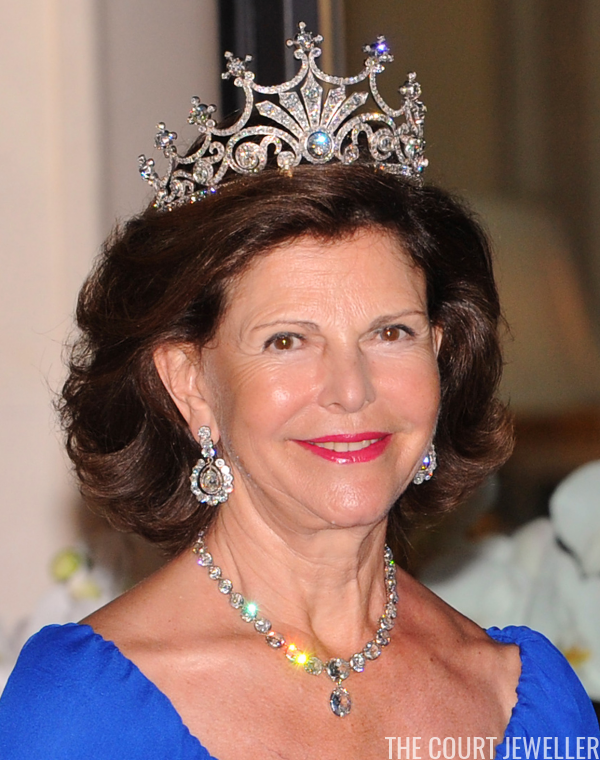 More often, though Silvia wears the earrings with another nineteenth-century piece: Queen Sofia's Tiara. She often dons the combination for the annual Nobel festivities, but she also chose it for the 2011 princely wedding gala in Monaco (pictured above).